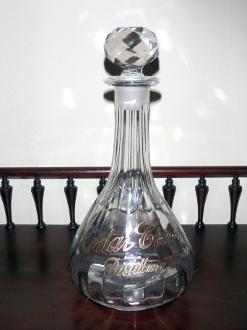 Cedar Creek Distilling Comany back bar bottle decanter with gold embossed lettering. Neck is paneled and bulb base is paneled. Decanter alone is 8 3/4" & with stopper 10 3/4". Lip has chip although it still displays nicely.